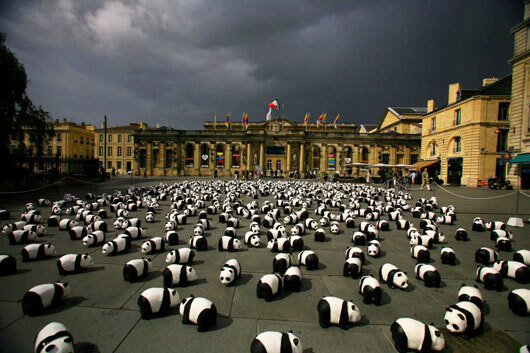 WWF-France, in celebration of its 35th anniversary, is running a campaign to raise awareness for natural environment preservation by parading 1,600 paper made panda models across the country. The parade started in July 2008 at Paris City Hall; followed by a few other locations across France; the most recent exhibition was at Paris’ Trocadero Esplanade on October 15… while the next stop would be at Grenoble on October 25. The panda (giant panda to be precise) is the symbol of the World Wildlife Fund; it’s estimated that there’s 1,600 pandas in the wild according to a 2004 statistic.